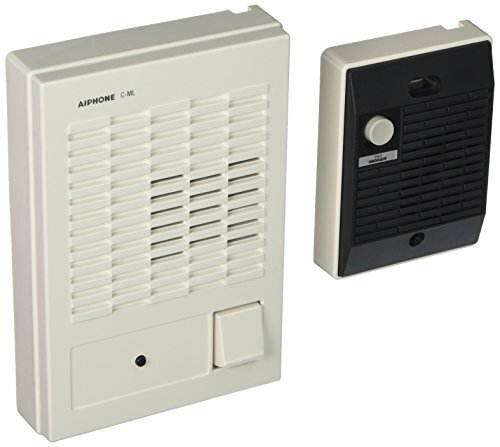 The Aiphone C-123L/A ChimeCom single-door answering system with single master intercom enables audio communication with visitors prior to authorizing access to the building with the door release button. When a visitor presses the door intercom’s call button, the master intercom emits a two-tone chime to alert the master intercom operator of the visitor. The master intercom has both a push-to-talk button and a pull cord that can be used to initiate audio transmission to the door intercom. Once the cord or button is released, sound from the door intercom is transmitted immediately to the master intercom, automatically shutting off after 20 seconds. The door-release button on the master intercom works with an electric strike (sold separately) to remotely unlock the entrance for the visitor. At any time, the push-to-talk button can be pressed or the chain pulled to listen through the door intercom. Housing is white plastic for the master intercom and black plastic for the door intercom. The audio volume on the master intercom is adjustable. The system is hardwired to be powered by a 6V power supply (sold separately) but can be powered by four C batteries (sold separately) to facilitate installation where power outlets are not accessible. The included adapter kit links another master intercom (sold separately) to the system.